I’ve begun to think about the relationship between free play and sustainability for our planet. Does the early childhood experience of hiding behind a wide tree trunk while playing hide and seek or daydreaming in a field of high grass as I did in childhood lead one to equate happiness, a sense of well being, with nature? Imagine— if somehow we could imbue the present generation with enough connection and joy for the out of doors as for their I-phone or latest X-man offering— how they might influence and steer the environment challenges which are already upon us. In preparing this blog, I went to my files to retrieve an article, Wild in the Streets, about the loss of free play, The Journal of the Massachusetts Audubon Society, May/June Issue, 1997. I was in private practice and ordered a dozen copies to distribute to highly anxious two career parents who were struggling with the demands of over-scheduled lives and its effects on their children. Given the explosive shift in global temperatures, weather patterns and Artic ice melts, Laura van Dam’s citation of scientific research on the benefits of play on long-term development are particularly salient now. As a family therapist trained in systems thinking, I was struck by how a family’s daily choices and the rhythms of their everyday life affected mood and ease of adaption. And while no doubt everyone can find nurturing from the natural world, children who need an alternative to unhappy home situations —and over scheduling, a break from technology —may particularly benefit from quietude outside. I introduced the notion of “play,” shifting the rhythms of structured activities to more spontaneous, out of doors activities, to my clients. Those with childhood experiences in nature tapped into their positive memories and embraced the notion of intentional choice. Clients who clung to structure resisted and needed point-by-point homework assignments to dip their toes into what seemed unnatural. In time, perhaps because of my own certitude in the benefits of embracing the natural rhythms in one’s life, I helped families flex and find more balance. Given the merchandise hawking of the latest technological gismo and our lemming impulse to follow, the challenge of offering the next generation quietude in nature is more daunting. 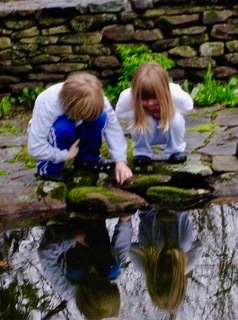 Yet, through Facebook posts, I experience possibility and hope reflected in the many stories and pictures of my colleagues raising children in New York City or in forested Greenfield, MA, where they offer their children extensive opportunity for play, connection and creativity in the out of doors. Out door experiences, particularly before adulthood, is the most frequent motive people give for caring for the environment. Time outdoors can nurture a deep concern about the natural world. ….the natural environment offers space and time for reflecting on one’s own— which is critical to developing a sense of self. The question at hand—how does one train the self as well as the next generation to shift attention to the larger issues of global warming and its effects? I would be grateful if you could share your experience in my comments section or on Facebook. This entry was posted in Happiness, Mindfulness, Nature, Politics, Relationship(s), Sustainability, Uncategorized, Well-Being and tagged benefits of free play, caring for the environment, nature benefits children on June 19, 2017 by fayewriter.